Lou's only 1967 OPC appearance is with Curt Flood as a "Card Clubber". Here are the Topps and OPC "Cards Clubbers"
Great year for Brock and Cardinals. World Series in "new" Stadium. I have been to world series games in St Louis in 1964 ( Grand Avenue Stadium), 1967 ("new round stadium"), 1968 , 1982, 1985 , 1987 , 2004 , 2006 ( new retro stadium) and 2011 ( Game 6 ). 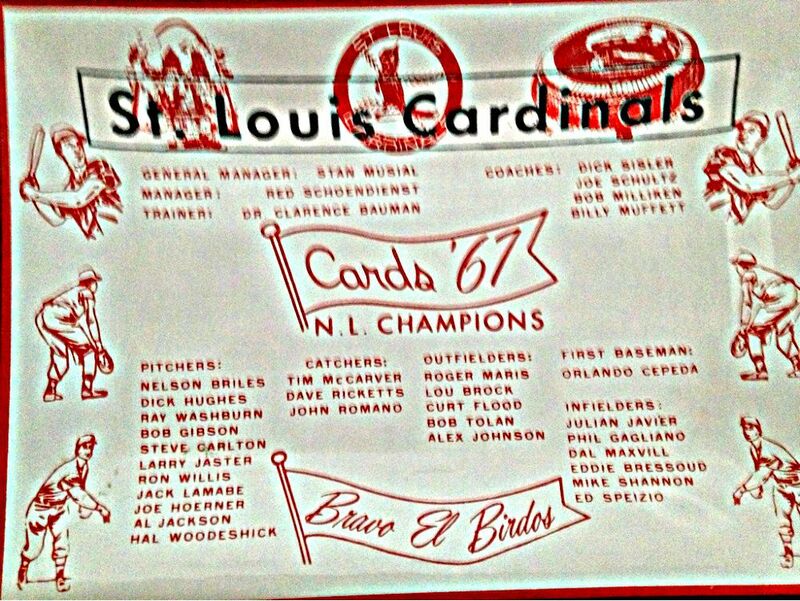 Well, here is a picture of the 1967 World Champion St. Louis Cardinals to start 1968 off with. It's actually more on postcard stock with a blank back. Al, you've been to a few WS games in St. Louis. Is there anybody alive who has been to a World Series game at Wrigley Field??? hee hee..... sorry Cub fans. LOL, looks like a modern "chrome card"! Your wish is my command. This is a tough panel, maybe all the 68's are tough? I don't know, but I looked for years. I think I've only seen 1 or 2 others on Ebay in 10 years. Also pictured is his page from the Tipps from the Topps pamphlet which is the same as the card, but in black and white. Interestingly enough, in the booklet, Maury Wills instructs on sliding, Bert Campaneris in base stealing, and Brock on base running. Al - What is the poster you put up there of the El Birdos champions? LOL. No one under 30 knows what an ash tray is used for, or why anyone needed them. The Greyhound Bus Company put out these pamphlets honoring the Stolen Base leaders. This is the one from 1968. I do not have one from 1969 and to my knowledge have never seen the 1969, but have all the others up to 1976. It is folded over to show the cover, I think it is Bert Campaneris to the left of Brock under the fold. Great idea for a thread, David! I just looked at Lou's baseball reference page. I can't believe he stole 118 bases in 1974...at age 35! I'm 41, and I don't steal anything but extra sleep. How the hell could he do that in his mid 30s? In 1968 Atlantic Oil put out some "Cards" which were given out when you purchased gas at an Atlantic Oil (Originally part of Standard Oil, then became ARCO - Atlantic Richfield, then purchased by Sunoco). Some could be redeemed for money, making them almost impossible to find. There are also some variations I think in regards to the printing of the number on the front (Black ink vs. Gray Ink). I haven't chased them that hard..... yet. Due to the nature of issuance, I doubt a NM example exists of any of these. The Cardinals won the WS in 1967, beating the Red Sox in 7 games (much like the Cubs did well over a century ago). As a result they are featured in the 68 Topps set. Brock and Gibson were once again the stars, and in game 1he had 4 hits, thus getting him on the first WS card. Here it is in a blank back "proof" of some sort, Venezuelan, Topps, and OPC. Hey David where have you been? I hope all is well with you it's been two days without any new Brocks. I look forward to your Brock posts. Here a Malcolm Emmons photo to keep your thread going. Busy weekend, here are the 68 Topps regular and All Star Cards. I think the 68 AS puzzle on the back is Orlando Cepeda, but he is using Lou Brock's bat. He does not have OPC or Venezuelan issues of these cards. Backing up a year to 1967 again, here is a ruler that I overlooked, similar to the 1966 ruler. I have seen an occasional 1966 and 67, but never any other years so perhaps they were only made these 2 years. Transitioning from 1968 to 1969, here are some buttons. 1967 National League Champs, 1969 MLBPA large pin (identified looking at the back, and along the edge where the pin meets the metal, you can make out 1969 MBLPA), 1969 Kelly's Potato Chips (also says 1969 MLBPA along back edge), and 1969 MLBPA small pin (also identified by looking at the back along the edge of the pin). After the Cards successes in 1967 and 68 Lou would be on many issues the next few years. However the Cards were about to head into a long dry spell with little success, due in part to some really bad personnel decisions. ...40s, good--50s, bad--60s, good-- 70s, bad-- 80s, good-- 90s, bad-- 2000s, good. In 1970 the rotation featured Jerry Reuss age 21, Mike Torrez age 23, and Carlton age 25. All traded for various reasons. In 1968 they traded 22 year old Bobby Tolan for 30 year old Vada Pinson. In 1971 they brought up 21 year old Jose Cruz and sold him in 1974 to the Astros. Fireballing Jim Bibby came up in 1972 - traded to the Rangers in 1973. 1974 nice trade for Reggie Smith - 1976 traded him for catcher Joe Ferguson when you had Ted Simmons???? Bake McBride wins ROY 1974 traded 1977 for spare parts. All we got was a Wood Chuck ? Finishing out 1968 - I don't really collect all the numerous magazine covers and baseball periodicals Brock appeared on, there are dozens from SI to Baseball Digest to whatever, but after the 67 World Series the Cards toured Japan (despite the loss to the Tigers). Here is a magazine on extremely cheap paper all in Japanese which was I assume sold in Japan. How it got to the U.S. I don't know. Brock, Gibson, and Cepeda are featured prominently, however the bulk of the magazine is Japanese players and teams. From 1969 to the mid 70's Lou Brock was featured on a lot of cards each year. Here is the 1969 Milton Bradley board game card. (Clearly I am in need of an upgrade on this one, I am not sure what the grease smudge is on it). I remember playing this game (or maybe the 1970 or 72 version of it) at a friends house. Just a side note...some pretty cool Brock transparencies in the thetoppsvault auctions on the bay. Oh and thanks for sharing; very nice items. Thanks. I have a few Topps Vault items. They have some cool and one of a kind items. In 1969 Nabisco put cards on boxes of Nabisco product. Also using the same picture was Globe publishing, which printed these black and white "cards" which are really just thick paper and anyone with a photo copier I suppose could make them. I assume mine is real. Either way they have little value. Also in 1969 Sports Illustrated made posters using the same images as the Nabisco cards. The poster is on ebay all the time, I don't have one, I just don't have anywhere to put it up. In 1969 the fledgling MLBPA was promoting the players in many ways. They produced these MLBPA "Photo Stamps". They apparently came in several ways. Here is a booklet to glue them into, along with the stamps. They also came in a large sheet format. The fronts are the same, the backs are different. Tomorrow I will put up the large sheet front and back. I did not know that..... But I've never looked for the other stamps either. The Photostamps also were in large sheets, with different backs. I believe there was also a larger size album to put them in, but if there is I can't find the one I had. I could be wrong on the large album also. You can clearly see the differences in the backs. The full AL and NL albums are much bigger than the Divisional ones. Last edited by ALR-bishop; 09-24-2013 at 11:35 AM. 1969 Topps 4 in 1 - World Series game 4 featuring Lou Brock's leadoff home run. 1969 Topps and OPC cards. 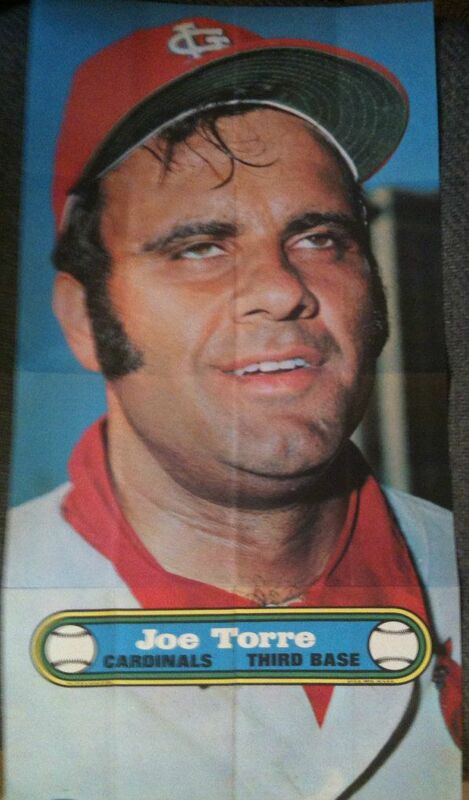 1969 Topps Poster. These are larger than the 1970 ones, and a lot harder to find. All the players are on there, but the scan is missing about 2 inches in the middle. Mike Shannon looks drunk in that pic Cool piece though. I'd like to have one eventually to frame. The last of the Topps issues for 1969 - Stamps that went in albums. Each team had an album with player stamps to lick and put in the album. Here are some Cardinal albums and some stamps. I suppose you could collect these stamps in a hundred different "variations" based on how they were torn off, I have a couple of panels and a single stamp here. He is not in the 1970 3 statue per box Transograms. Well what would you expect for a realistic reproduction with interchangeable parts ? I think this finishes out 1969, some Transogram cards cut from the box, plus a side tab. They are all blank backed. Lou didn't have much from Topps in 1970, but plenty from other places. Here is the Topps poster.